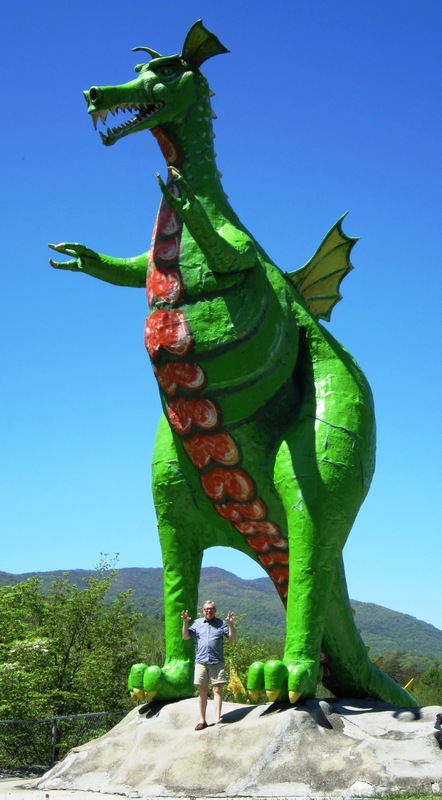 Tennessee Dragon – The Home of My "Big Things"
Our last Big Animal on the Spring Break trip to the Smokies. Actually we noted this on the way down just south of Exit 134 along I-75. Take the exit in Caryville, TN go east about 100 yards and turn south on John McGhee Blvd, Rt. 116. John McGhee was the son of the railroad magnate Charles McClung McGhee active in railroad building in eastern Tennessee. Anyway, this dragon is south about 1/2 mile, just past the Motel 6 at the site that was once the Thunder Mountain Fireworks. We didn’t see any sign of Thunder Mountain except a concrete pad. Oh well, the dragon still looks pretty good, enjoy!